The UBC Okanagan Heat golf teams will tee off their tenth season of competition this weekend when they host the PACWEST season opening tournament at their home course The Okanagan Golf Club. The student golfers are back this academic year after teaming up with the GolfBC Group to raise $60,000 to support the golf program. 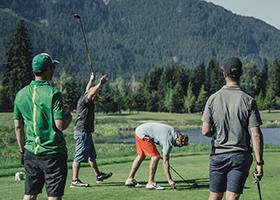 The students and members of the golfing community raised $27,000 through a series of fundraising events, and GolfBC – together with its parent company the Burrard Group - pledged an additional $33,000 to the program, making them the largest single-season contributors to the UBC Okanagan athletics program. "We are proud to be a part of the Heat Golf season and excited by this year's lineup of players," says GolfBC Vice President of Golf Operations Andy Hedley. "We have an excellent team and we're thrilled to see them tackle their season opening tournament." The 36-hole tournament will be played on Saturday and Sunday (Sept. 16-17) on The Bear Course featuring a par-72, 6,885-yard layout. Although the men's scoring five-some has yet to be determined the Heat men's golf team blends five returning golfers with three newcomers who will all compete at their home tournament, with the three golfers striking out as individuals at the team event. James Casorso (in photo) is back for his fifth season and looks to finish off a stellar career that saw the Immaculata grad earn an All-Canadian last year. The four other returning golfers will all be competing in their third season, as Grant Dollevoet, Derek Graham, and Olliver Rizun have golfed for three straight years while Casey Sullivan is back after taking 2016 off. The three newcomers hoping to make the travel squad are all from the Okanagan Valley. A second Immaculata grad, Nik Federko will join Lake Country's Dylan Jonstone and Vernon's Ryley Johnson on the team. The women's scoring side for UBC Okanagan will be clear all year long as the roster boasts just the two returning golfers, fourth year Emily Adams and second year Kelowna golfer McKenna Lesiuk. Lesiuk in her rookie season last fall finished fourth in the province for the PACWEST season and Adams is the last holdover from the national silver medal winning team in 2015. The four tournament PACWEST league will begin in Kelowna this weekend, make three other stops, as teams hope to qualify for the 2017 PING CCAA Golf National Championships hosted once again by Durham College. The National Championships will take place at the Royal Ashburn Golf Club, Oct. 17-20, 2017. The PACWEST provincial champions are crowned on cumulative scoring over the four tournaments at the Ledgeview Golf Club in Abbotsford, BC October 7-8. The middle two tournaments will take place on Vancouver Island at the Morningstar Golf Course (Sept. 23-24) and the Highland Pacific Golf Club (Sept. 30-Oct.1) in Parksville and Victoria respectively. The Burrard Group has been active in the real estate industry since 1977, building a diverse portfolio of successful master-planned communities, residential developments, commercial projects, lodging/hospitality properties and golf courses. Adding value to communities, the environment and peoples' daily lives doesn't stop at the property line, and the team at Burrard believes that as a developer (and as citizens), there is a social responsibility to strengthen the fabric of society. Through charitable foundations, Burrard Group have donated to, developed, and operated significant charitable and non-profit initiatives that have given back to the communities in which we live and work. For information on the Burrard Group, visit www.burrard.com. The GolfBC Group - Burrard's golf portfolio - is committed to defining a higher standard of quality and consistency among premier golf destinations. GolfBC is the owner/operator of eight championship golf courses in British Columbia, including Nicklaus North (Whistler), Furry Creek (near Lions Bay), Mayfair Lakes (Richmond), Gallagher's Canyon (Kelowna), The Quail and The Bear at The Okanagan Golf Club (Kelowna), Olympic View (Victoria), Arbutus Ridge (Cobble Hill), as well as a 9-hole facility, The Pinnacle (at Gallagher's Canyon, Kelowna), and the Gold, Emerald and Blue courses at Wailea Golf Club on Maui, Hawaii. Read more about the fundraising efforts of the student's at UBC Okanagan.